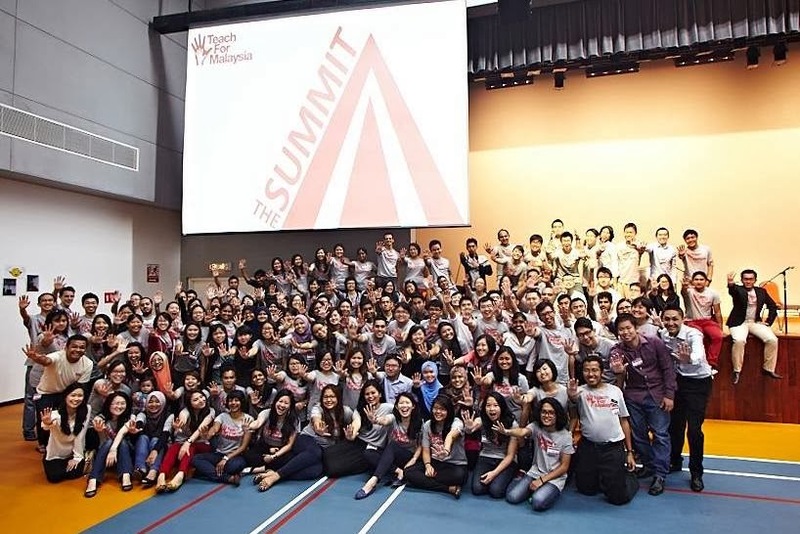 On the 24 of August, I was invited to give a keynote speech & conduct a workshop for the first Teach For Malaysia conference in KL, The Summit. It was a big honour for me because I am just a young teacher in the jungle. I never expected such a prominent NGO to come calling. I'm not an expert in anything. Not a trainer of any sort. Not even a Master’s degree holder. I felt slightly intimidated with the task of giving a speech (which is essentially telling people what to do) but the officers at TFM had such faith in me. I was encouraged & decided to give it my best shot. 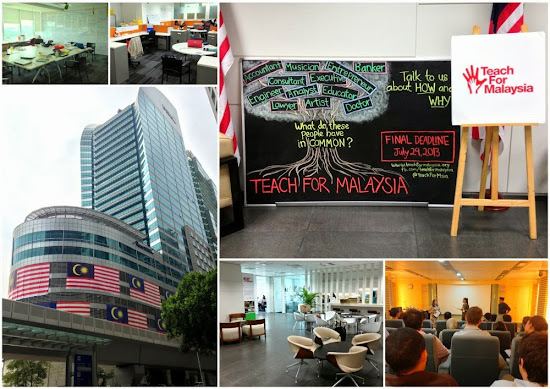 Before the conference, I was able to spend some time at the TFM office in the UEM tower at KL Sentral. Security is pretty tight in the building with magnetic doors everywhere but once I got inside, I could see the efforts at creating an environment for collaboration in the organisation. The walls were covered in whiteboards where people scribbled their thoughts & ideas. Lots of mobile whiteboards on wheels too. Some of them had "do not erase" stickers on them. I met the staff & treated them to some goodies from the East side. From the onset, they made me feel at home & part of the TFM family. I could really feel their can-do attitude & I enjoyed working with these talented people. During my time there, my spoken English improved dramatically & I absorbed all the positive energy bouncing off the walls. 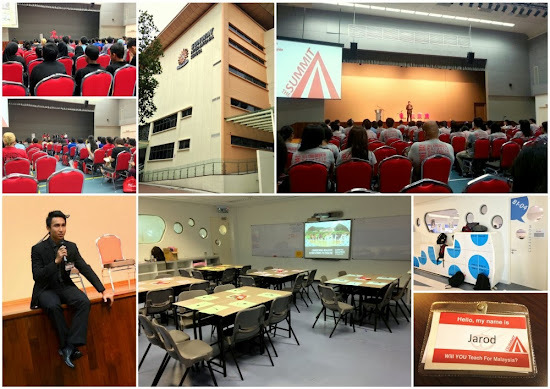 The 2-day conference was held at the Sunway International School. A new, beautiful & well-equipped international school. On the first day, I did a workshop where I shared what I did at my school to "Conquer Negative Associations to English". Basically, I shared the things I did during my 2nd & 3rd year as a teacher. I have uploaded the powerpoint slides & they are free to download from scribd. Have a look & see if you can do the same at your school. It'll probably be something that you've been doing already. You can see the hall where I delivered my speech & the classroom where I conducted my workshop. On the second day, I delivered my keynote speech. 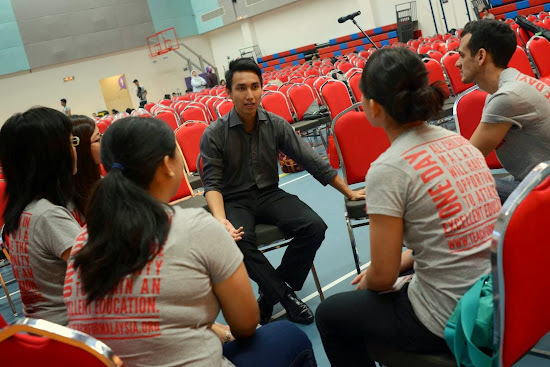 It's just little old me talking about what I think about our education system, what teachers should be like &, at the end, challenge the TFM fellows. I was really nervous & I'm not sure if I made sense or if I confused them even more! Lol. All in all, I had a gut-wrenching blast & it was an achievement unlocked. Here's a short video from TFM offering glimpses of the conference. You get to hear my squeaky voice say a really cheesy line somewhere too. One thing that really hit me about this conference was that the TFM staff got everyone to sit in groups once every day to discuss what they've heard & reflect on how they will apply it. This is missing in many conferences. I believe it adds to the value to the conference as it increases the likelihood that people will leave with something or do something differently after the conference. If I were to sponsor anyone to a conference, I'd make sure someone does this with them. Also, after mixing with the fellows & listening to their stories, I cannot help but feel impressed at the work they have done. They were all sent to the worst schools in Malaysia for 2 years & made accountable to achieving progress. Some of these schools, I don't think I'd want to even work in for 2 weeks. (Mainly because the students themselves are hostile or aggressive.) Many of them have achieved victories & made a real difference in the lives of their students. Which makes me wonder if I'd be able to do the same if I were in their shoes. I guess I'll never know until I actually get to doing it. Who knows? I really love a good challenge & thinking about this really gets my heart racing. If I were to do something like this, I'd do it in Sarawak, my ibu pertiwiku. And, I'd do it from within the system & lead others in the system who wish to do the same. Many great teachers within the system have already gone before me. They, together with the TFM fellows, shall be my inspiration. View all the pictures here on my FB page & TFM's page.